Craig P. Coy, 54, spent twenty years in the U.S. Coast Guard as an officer and helicopter pilot. He served as a White House Fellow and counterterrorism adviser during the Reagan administration. 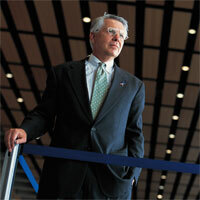 Prior to Massport, Coy was president and CEO of a Massachusetts company that provided human resources outsourcing for businesses. The Massachusetts Port Authority operates Logan International Airport, two regional airports in the Boston area, the Port of Boston, and the Tobin Memorial Bridge, which connects downtown with the northern suburbs. Massport has annual revenue of approximately $500 million and employs 1,149 people. Political fallout from 9/11 has profoundly changed the operations of the Massachusetts Port Authority (Massport), the independent public agency that operates Bostons Logan International Airport. After hijackers crashed two jetliners from Logan into the World Trade Center, Massport came in for withering public criticism over lax security. The CEO abruptly resigned. And a special commission appointed by the governor concluded that years of political interference had eroded the agencys ability to function in the publics best interest. Massport in early 2002 clearly was an organization in crisis, primed for transformation. Enter Craig P. Coy (MBA 83), appointed CEO in April of that year, and HBS professor John A. Quelch (DBA 77), appointed board chairman in June. Together, they embarked on a turnaround mission that already shows signs of success. Coy, who once piloted a U.S. Coast Guard helicopter on sorties over Boston Harbor, recently spoke with the Bulletin. What was your reaction when first approached about the Massport CEO position? When I got the call, I didnt really know much about Massport. But the more I learned about it, the more I felt like there was a good fit between my background and the requirements for leading this agency. In the aftermath of 9/11, I also had a desire to get back into public service. How did you approach the job? I took this on as a turnaround. With most business turnarounds, theres a question as to whether or not you have cash, customers, and a product. The beauty of this turnaround is we have all three. Its more of an organizational and cultural turnaround. I want to get people inside, as well as people outside, thinking about Massport as a professional organization. How do you fend off requests for political patronage jobs? First, we have a job freeze. So were not hiring anybody unless there happens to be a vacancy caused by a retirement, a resignation, or a death. Second, when someone calls, I ask, Surely you dont want me to hire somebody for a job for which theyre not qualified? I also ask, Surely you dont want me to hire somebody for a job that doesnt exist? The reaction from callers has been very positive and very respectful. Months of bad press after 9/11 must have crushed morale. How did you turn that around? Through a quirk of history, the hijackers were looking for big airplanes with lots of fuel that were going to fly near New York City. Boston is one of the places where you find planes like that. Now that a span of time has passed, I think its clearly recognized that Logan was not to blame for what happened. But theres still that stigma that the hijackers came here. We use that to spark a sense that Logans going to set world-class security standards. Were still the first and the only major airport in the country to have a fully automated baggage screening system (begun in December 2002). We did that within six months. Its a fabulous story of dedication and leadership and of commitment of people who were working six and seven days a week, 24 hours a day. They built a system that had never been built before. Are you spending more now on security than before 9/11? We are spending in excess of $20 million a year more on security. But we have maintained our operating budget relatively flat, which means weve had to take $20 million out of other areas. And thats quite a challenge without sacrificing safety or efficiency. What other security steps have you taken? Weve received a lot of attention for our behavioral pattern recognition program. The fundamental premise of the program is that people who are about to do bad things act differently from people who are doing normal things. And as a result, weve caught several people who have been either fugitives or involved with drugs. We worked with the state Attorney Generals Office and the ACLU to avoid concerns of racial profiling. How have you made Massport operate more professionally? We identified four strategic business objectives: operations, facilities, performance, and good citizenship (regarding surrounding neighborhoods). These objectives provide people a framework around which to figure out whether theyre making the right decisions. Weve also reorganized into three lines of business: aviation, maritime, and the Tobin Bridge (linking the city to its northern suburbs). General managers now have profit-and-loss responsibility. Empowering managers with P&L responsibility is significantly changing behavior and helps us build a stronger team. Logan is one of the nations most delay-prone airports. After thirty years of controversy, will a proposed 5,000-foot new runway finally be built? Its been a long process. There have been hundreds of community meetings. Thousands of people have participated. And there have been a number of court cases. The judges who have reviewed the evidence have all essentially come to the same conclusion: The new runway is necessary to fix the delay problem. The runway also will help reduce some noise and pollution for adjacent communities because all flights using it will land and take off over water. When will the new runway be available for service? Barring any other issues in the courts, which we dont expect, were probably going to start construction this summer. Well be up and running in 2006.